Blessed mary, st Joseph I pray for financial deliverance today. I pray for money to meet my financial needs.i place my legal situation into your hands.I pray for victory in Jesus name. DEAR ST JOSEPH IN JESUS NAME PLEASE HELP ME SO MY MOVE BACK TO MY OLD APARTMENT IS A BLESSING AND WILL OPEN A NEW DOOR FOR JONATHAN H AND I SO DOWN THE ROAD WE FIND A BETTER PLACE TO MOVE IN TOGETHER AND BE HAPPIER, HEALTHIER AND INSEPARABLE. PLEASE LET EVERYTHING IN FALL INTO PLACE FOR ALL OF US(JONATHAN H, RIMPY, ANGIE AND CHRISTOPHER) WE LOVE AND TRUST YOU. THANK YOU, AMEN! Pray St. Joseph for my nephew and his wife to return to the Catholic Faith/Church with a stirring in their hearts to join with full participation and faith in the love, peace, forgiveness and joy of Our Savior. Bless them with beautiful children who will be strong, healthy, normal, beautiful growing to love and serve you, coming from a now conception, with smooth, pregnancies, and uncomplicated, safe, joyful fast deliveries. Pray for Genevieve who will be 105 Thursday, overcome her with your peace, and she be lead to Heaven, with a peaceful death, without fear, without struggle. Dear St. Joseph be our protection against all that is evil. Teach us to be more like you. We pray for Father Jim Wuerth whom is going back to his hometown of Kentucky to be closer to his family. We wish him all the best. We at Padua place will miss him dearly. Pray your Devine Mercy chaplet prayer and the Holy Rosary, Thanks to all…. St. Joseph, please bless my sister Clarissa for her selfless sacrifices on my behalf. Heal her completely from her haemorrhoids which has lasted more than 10 years and help her to gain admission in the best pharmacy school in the county. 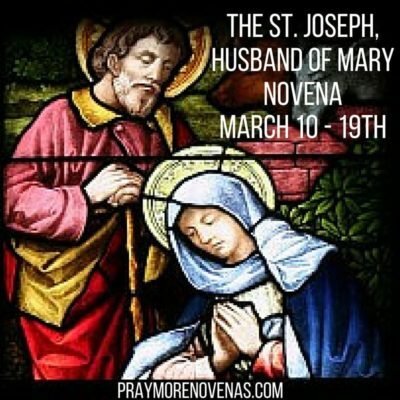 Also, grant the prayers of everyone praying this novena around the world. Dear St. Joseph, please ask Jesus and Mary to protect and heal my family and I Spiritually, mentally, physically and emotionally. Please heal us of depression, anxiety, allergies, asthma, TMJ, fibromyalgia, heart disease, diabetes, arthritis and colon problems. Thank you Jesus, Mary and Joseph. St. Joseph Pray for my nephew and his wife to return to the Catholic Faith/Church with an eternal flame in their heart to participate, be faithful to the love, peace joy of Jesus Christ. Bless LD and CD with beautiful children who will be healthy, normal, strong and beautiful to grow up to love and serve You and others; come from a now conception with smooth pregnancies and safe, joyful, uncomplicated deliveries. Make LD and CD grow in love for each other and Jesus everyday. St. Joseph pray for Genevieve who will 105 Thursday, to have a peaceful, happy death cradling in the arms of Jesus and Mary like you, without fear or struggle.